The Left must meet this moment in history with a bold plan to remake our economy — or someone else will. 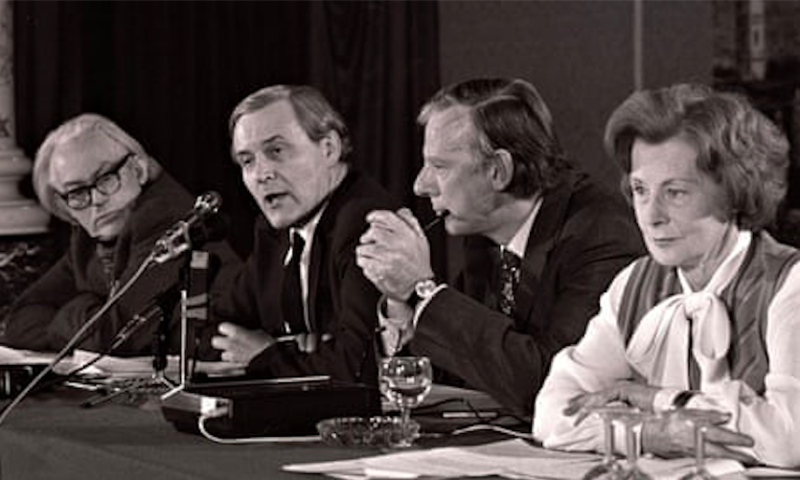 Tony Benn, Peter Shore, Michael Foot and Barbara Castle speak at a meeting against the Common Market in 1975. Theresa May and Michel Barnier do not agree on much. They’ve locked horns over the customs union, transition arrangements, the Irish border, and almost everything else up for grabs in the Brexit negotiations. But there is one thing they do see eye to eye on: the need to prevent a socialist Labour government from coming to power and implementing a sweeping programme of economic reform. It has long been an open secret that the European Research Group and other hard-right Tory Brexiteers have a very particular plan for the United Kingdom outside of Europe. Away from the paternalistic hand of the European Union’s nanny state, Jacob Rees-Mogg, Boris Johnson, and their friends foresee a ‘bargain basement’ economic model for the UK. They envisage transforming Britain into a capitalist utopia by slashing wages, promoting a ‘competitive’ labour market, and removing ‘red tape’ of the kind aimed at preventing disasters like Grenfell. Corporations, meanwhile, would have the run of the house, with low taxes, little regulatory oversight, and privileged access to the halls of power. Some have argued that concerns over such an outcome are what have motivated the EU’s insistence on a ‘level playing field’ post-Brexit, aimed at preventing the UK from undercutting the EU on tax and regulation. But consulting the detail of the Withdrawal Agreement — as well as previous comments from EU negotiators — indicates that a bargain basement economy is not the EU’s primary fear for post-Brexit Britain. Firstly, the level playing field stipulations on tax and regulation aren’t as strict as they might be: the UK would only be required to maintain existing protections, not update tax and regulatory measures as they are issued by Europe. Over the medium term this could lead to substantial divergence. But more importantly, the level playing field also applies to what the EU would call ‘state aid’. Providing active support to manufacturers through industrial policy, giving preferential treatment to local companies in procurement, or nationalising key industries could be interpreted as violations of this ‘level playing field’. These kinds of ‘populist’ economic policies are causing EU officials much more concern than the free-market fundamentalism of the ERG. Last year, Times journalists reported that senior EU officials had revealed that ‘concerns over Labour’s economic policies are the main reason for the EU’s insistence on a tough “level playing field mechanism” in a future deal after Britain leaves’. The standard response to this argument is to claim that there are plenty of other EU states with nationalised industries and interventionist states, and that there is no specific text that definitively prohibits any of these things under EU law. These points are both true, but defaulting to a liberal, legalistic interpretation of the relations between states under financial capitalism is at best naïve and at worst deliberately deceptive. The point of an objective, enforceable legal system, according to the liberal tradition, is to ensure that all members of a political community are held to the same, collectively-determined standards of behaviour. But no such system can exist at the international level because there are no mechanisms for enforcement. Instead, states volunteer to subject themselves to a set of rules that they determine collectively. The powerful are obviously more able to influence the development of this legal system than the weak. But perhaps more importantly, the only punishment for disobeying the rules are political opprobrium and economic sanctions. And these two things hurt some states more than others: Bulgaria can hardly afford to confront the combined might of the EU27, but Germany most certainly can. This was made abundantly clear when both France and Germany faced absolutely no sanctions for failing to abide by the deficit targets in the Stability and Growth Pact, while states such as Greece and Italy have been subjected to the most brutal, almost neo-colonial treatment, for daring to flout the EU’s economic norms. In this sense, international law in general, and European law in particular, is enforced selectively in the interests of the most powerful states. European legal institutions and jurisprudence reflect European power relations: relationships between states intersected by relationships between social classes. To materialists, this will be no surprise. Marx’s remarks that the capitalist state is a ‘committee for managing the common affairs of the whole bourgeoisie’ apply equally to international institutions. The executive of the European Union has both the motive and the might to severely discipline any socialist government in the UK — just as it did to President Mitterand forty years ago when the Stability and Growth Pact was born. Germany, with its rabid anti-inflationary bias, and France, currently suffering from Macron’s attempts to introduce a ‘competitive’ labour market, would balk at the idea of mass state intervention in the British economy. Meanwhile, the cabal of lobbyists, advocates, and special interest groups that are so influential within Europe would move heaven and earth to cut short any attempted experiment with socialism. The failure to see through the veil of liberal institutions to the power relations that exist beneath is a failure to understand capitalism itself. Nowhere was this made clearer to me than during a recent trip to the United Nations Conference on Trade and Development (UNCTAD). I was addressing a room full of delegates discussing a recent report critiquing the impact of financialisation on the global South, and advocating a global new deal in response. The G77 and countries like Pakistan and Chad stood up to welcome the findings of the report, while the delegate from the EU scolded UNCTAD for having ‘overstepped its mandate’. Whatever progressive multilateralism might look like, this is clearly not it. UNCTAD has repeatedly advocated the kind of global new deal that would be a non-starter for the European Union, and this is the post-Brexit path that the British economy must take. On the national level, a Labour government’s plan for a post-Brexit economy must involve a massive programme of green investment for the UK economy — both to absorb the initial shock to demand that leaving would inevitably cause, and to reshape the nature of accumulation over the longer term. Such a programme would entail billions of pounds worth of investment in green infrastructure, social housing, and research and development, as well as targeted support for manufacturers and exporters of environmentally-sustainable goods and technologies. It would be accompanied by a transformation in the nature of ownership through nationalisations of key infrastructure and utilities, an overhaul of corporate ownership and governance, and the growth of the cooperative and mutual sectors. On the international level, the first thing a Labour government must do is work with genuinely multilateral institutions to bring an end to harmful practices that hurt both the global South and the vast majority of people in the UK. This means shutting down the tax havens, curbing capital mobility, and bringing our extractive finance sector to heal. We should also argue for the maintenance of free movement of people within Europe, and expand our own migration policy to include much greater migration from those parts of the world most ravaged by neo-colonialism. This requires a shift in Labour’s narrative: we need to construct a new oppositionality, one that pits working people of all colours, creeds, and religions against the corrupt and extractive elites that have us blaming each other for the problems they have caused. If a general election is called, and if Labour wins, it should return to the EU with these policies as our red lines. Effectively, our negotiating position should be the opposite of the government’s: we want limits on capital mobility, whilst maintaining free movement of people. Some unimaginatively argue that such a strategy would not be electorally viable. But research from recent elections suggests uniting class concerns with progressive approaches to migration is not only viable, it is the only way forward for the Left. This implies a more insurgent approach that attacks the power of entrenched elites and constructs a unified ‘us’ in response, meaning John McDonnell’s ‘tea offensive’ strategy to dealing with finance in the City would have to go out the window. The development of most concern to European elites is that citizens across the continent are beginning to realise that a better world is possible — but it is not prefigured by the extractive, neoliberal, and neo-colonial politics of the European Union. If the Left fails to recognise this and show what this new world might look like, the Right will do so instead. Grace Blakeley is an economic commentator at The New Statesman. She is the author of the forthcoming Stolen: How Finance Destroyed the Economy and Corrupted Our Politics from Repeater Books (2019).